Our EIPR IP Routers have gotten a lot of attention because they allow users to maintain their factory-set IP addresses when integrating with a customer's IP network. This reduces installation time, eliminates IP conflicts and allows users to easily comply with their customer's IP requirements. Modern machines are comprised of various complex subsystems that communicate via the Internet Protocol (IP). The machine builder pre-defines each subsystem IP address and the range of addresses devoted to each machine. This addressing convention may conflict with the addressing policies of the customer, potentially jeopardizing a speedy integration of the machine to the plant. 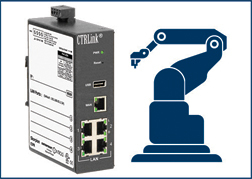 An IP router can quickly and effectively integrate machines to the customer's existing IP infrastructure benefiting both customer and machine builder alike. Because machine IP configuration is a fairly complex and new field, we've written a white paper that explains how the IP router can be used successfully. The white paper, titled "Simplify Machine Integration with Customer's Existing IP Network" is available for free from Machine Design. Register to read the full white paper. To learn more about the EIPR, visit www.ccontrols.com/machine.